that my son, Chip, did such a wonderful job planting my flowers and herb garden this past weekend. It's the vegetable garden this coming weekend. that it is once again time to wear shorts. I can almost hear my legs saying, "ahh yes, sunshine again!" 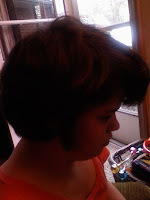 Ashley is in the eighth grade this year – her last year in middle school. And as is the tradition at our middle schools, the eighth grade dance is coming up in just 3 weeks. I can’t begin to tell you how much I would like for Ashley to go to the dance, but there are some obstacles. First, the dance is from 7pm till 8:30pm. Ashley, because her daily seizures wear her out, is usually asleep no later than 6:30pm each night. I would be willing to let her stay home from school and sleep all day though if she wanted. Secondly, while not all the 8th graders go with ‘dates’, I really don’t want Ashley to go alone. A lot of really wealthy families live within a few miles of my not at all wealthy neighborhood. Inclusion is not a familiar word to many of those families. Parent’s attitudes are passed to their children, and as a result, Ashley would probably be excluded at the dance. Unless…she went with a ‘date’. Justin is a classmate of Ashley’s and he has been very protective of Ashley during the last few school years. But how do I ask his mother if he can go to the dance with Ashley? Both Ashley and Justin would need adult support during the dance, but I also think they would greatly enjoy each other’s company. And the final obstacle? I don’t think Ashley really cares about going to the dance. Yes, she would love a new dress, but she would be just as happy going out to dinner in that dress. Because most of the regular education students have ignored her all year, she doesn’t have friends she would look forward to seeing. And, because school itself has not been a positive experience this year, going back into the school building at night is not something that would thrill her. So, do I ask Ashley to make one of my dreams a reality, or do I let her be her unique and special self, making her own decisions and living life her own way? As sad as missing the dance might make me, I believe I know the answer to that question. My regular readers know that I feel it is important for people with disabilities to explore and develop their creative abilities. Ashley, for example, has always enjoyed making three dimensional art, and she is included in a regular education art class at her school this year. It is her favorite class and her art work has been displayed around the school and in a local art show. So, you can imagine how excited I was to find this story on the Alexander Society. From their website, “The Alexander Society for Special Needs was incorporated as a non-profit society on November 17, 2000, and received Charitable Status on November 14, 2001. The Society is based in Wolfville, Nova Scotia, Canada and has a six-member Board of Directors. The objects of the Society are: to provide arts-based educational programs to children and teens with special needs, to provide resources for people working with special needs populations, to organize workshops and special guest speakers, to produce materials such as videos and workbooks, and to promote the inclusion of people with special needs into their communities." Although this program is in Canada, I believe it can serve as a model for all of us. I plan to share this information with Ashley’s art teacher, Ms. Wirz. Ms. Wirz is young, enthusiastic and has been the driving force in Ashley’s inclusion in both art class and the school’s art club. I believe she is just the kind of person who can take this model and run with it!! Please no one show this video to Ashley. If she sees it, she will never stop asking me where she can sign up for the next jump. that the weather has finally gotten warm enough to think about planting my flowers, herbs, and vegetable garden. If you need me either of the next two weekends, look for a patch of soil. for the wonderful respite weekend I had last Friday-Sunday. I was able to have dinner with my brother, go to breakfast and spend some time in retail therapy with my friend, Lynnette, spend the afternoon with clowns, elephants, and high-wire walkers and Lynnette and her beautiful daughter, Brooke, and then visit the Botanical Gardens on Sunday morning. And, oh yea, I can't forget the 300 bikers who shared my hotel. Now that was fun! that this weekend I will start to pull out the shorts and summer clothes. Ashley is going to be so excited! that Corey was able to spend last Sunday with his grandparents. It's been way too long since they last saw him. that Corey is attending a Youth Job Symposium at our local community college this Saturday. He NEEDS a job this summer, and I NEED him to find one. for beautiful Dogwood trees - especially the pink ones. 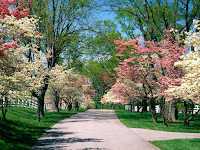 Driving through my neighborhood is almost like driving through fairyland with all the pink and white Dogwood trees. It is, of course, our state tree! 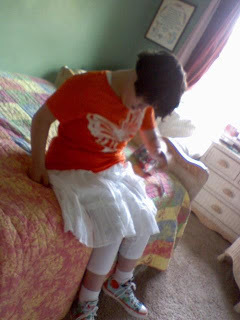 Ashley loves her new summer skirt and butterfly shirt! When Ashley first started school (age 2.5, 12 years ago), I told them she needed sign language support. When they shut down all classrooms for children with hearing impairments and who sign (versus children with cochlear implants), I reiterated that Ashley needed sign language support. When we began our path to due process in elementary school, I told them yet again that Ashley needed sign language support. The consultant they hired to evaluate Ashley said she needed the support of a fluent signer. The consultant I hired to evaluate Ashley said she needed the support of a fluent signer. When they hired a fluent signer to work with Ashley, the pay was so bad the signer left after one year. I told them they needed to find someone else. When Ashley was transitioning to middle school, I told them it was even more important to have a fluent signer with her. At home, she was signing sentences, and I proved it to them by videotaping her. For a while in middle school, they had a wonderful and fluent signer with Ashley. Ashley learned by leaps and bounds. Then, of course, they replaced that person with someone they are training in sign language. Now, high school transition is looming, and the person being trained is still not signing anywhere near as much as Ashley. The consultants the school district contracted to evaluate Ashley’s communication said during our meeting today that Ashley needs a fluent signer for the entire school day. So, should I believe that this time the school district will listen and do what I have asked them to do every year for the last 12 years? Or do I just give up? I must admit that there are many days when I just want to give up…. Ashley has been a student in our school district for 10 years. And for 10 years I have had to fight to get her the support she needed to appropriately develop a communication system. The fight has been exhausting, but it has been worth it because Ashley is a fluent signer now. But not all parents have the ability or the resources to fight the battles that are emotionally and physically exhausting. Knowing this, I was excited to hear about a new study concerning communication for children who are deafblind. A recently completed five-year study, conducted through the Schiefelbusch Institute for Life Span Studies at the University of Kansas, adapted the gestures and noises used by typically developing infants to form a communication system for deaf-blind children. The researchers had to find a way to make the children want to communicate a need or desire, said Susan Bashinski, a principal investigator who is now an associate special education professor at East Carolina University. For example, they made a child aware that a toy was nearby, either by touch or by using vibrating toys. Then, they would teach a child a gesture to indicate he or she wanted the toy. "Eventually, they have an 'aha' moment where they understand that they are not just a passive member of the environment, 'I can do this action, then you can do this and interact with me,'" Bashinski said. Currently, many deaf-blind children barely communicate until they are old enough to start learning sign language. But they often struggle with that because they didn't first learn the gestures and noises that are the foundation for communication in normally developing infants. Those gestures and noises have been successfully adapted to help developmentally disabled children who can see and hear, a method called Prelinguistic Milieu Teaching. The new study adapted that method for nine Kansas children between the ages of 3 to 7 with varying degrees of deaf-blindness. Working at the children's schools, researchers sought to increase the number of times the child communicated per minute and the number of gestures. The results will be published this month in the journal Research & Practice for Persons with Severe Disabilities. 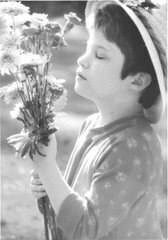 The study bolsters earlier research on the importance of prelinguistic communication and emphasizes that deaf-blind children need intensive one-on-one work to begin learning communication, said Kat Stremel Thomas, project coordinator for the National Consortium of Deaf-Blindness, which supports states' work to communicate with deaf-blind children. She said further study needs to determine if the children move on to pick up more complex communication skills. And, she said, some way needs to be found to share what was learned with those who work every day with deaf-blind children. "All brain research shows that the younger kids are when they get appropriate intervention, the better the outcome will be, especially in literacy and communication," she said. Did you get that, school district? The earlier the better. If you didn’t get it, don’t worry, I’ll be sure to keep reminding you! If a surgery existed that might help your child’s disabilities, would you agree to it? Parents of children who are deaf agree to cochlear implant surgery daily. But what if your child was blind, and what if the surgery was experimental? I wrote about my feelings on this subject two years ago, but what about you? What would you do? that the sun finally decided to reappear in my corner of the world. The more it rains, the more the devil's spawn, known as camel crickets, come in my house. that Steve-O got kicked of Dancing With The Stars. I know he was trying at the end to do better, but he's just not my cup of tea. that Ashley's regular bus, driver and aide are back. My cranky pants rant earlier this week worked. that I get to go to the circus with Lynnette and Brooke on Saturday! It's the same circus that I took Ashley to see, and it was great. I bet Brooke is going to love it! 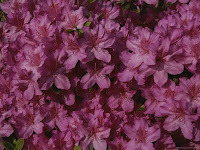 for my beautiful blooming azaleas - bursts of white and pink! for Brewster's ice cream in a waffle cone. Did you know that after buying 10, you get one free? I'm up to 7!! that in just three or four weeks, I will be planting my vegetable garden. 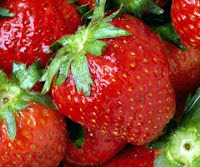 My mouth is already watering thinking about fresh cucumbers, squash, and tomatoes. for people like the woman on Britain's Got Talent who shattered preconceived notions about one's abilities being linked to one's appearance. for educators who care, really care, about doing the best job possible (that would include you, Lynnette, and you, Amy!). Today I am not happy – really not happy. I’m going to be putting on my cranky pants as I write this blog. So, if you are not in the mood for a rant and would prefer to find the secret to happiness, I suggest you go here, here or here. Almost two years ago I wrote a post titled RTFM. 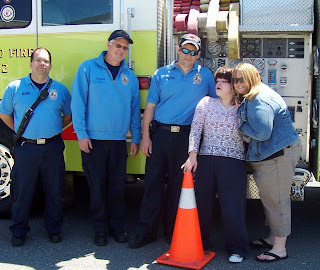 I wrote about Ashley having to adjust to yet another change in bus drivers and bus aides, something that unfortunately she has had a lot of practice doing. And it always amazes me that no information – that would be absolutely nothing – is shared with the new bus staff – even though Ashley has been a student in our school district for 10 years now and has a file that takes 3 women or 2 burly men to lift. Well here we are again. Tuesday morning, Ashley’s bus was 30 minutes late. I reasoned that perhaps the rain was slowing traffic down, or maybe one of the other students was running late. But no…. The bus was late because there was a new driver, a new aide, and a new route. Did anyone bother to tell me about these changes? I think you know the answer to that question. So, as the bus pulled to the end of our driveway and I tried to assist Ashley onto the bus, she splayed her arms and legs like a dog fighting to not go into a bathtub and refused to get on the bus. Instead of two women, there were now two men – two men we have never seen before in our life. I’m sure passing through Ashley's mind was our talk about stranger danger. After I assist Ashley in sitting down, I tell the aide and driver that Ashley has seizures. They both say in unison, “OK.” Neither asks what the seizures look like or what they should do. I’m fuming at this point and as soon as the bus pulls away, I am on the phone to our school’s transportation office. I am treated like I am 5 years old, and am told that bus routes often have to be changed and that I need to deal with it. Umm um. That’s exactly what I am going to do – deal with it. So a little while later, my scathing email is traveling cyberspace on the way to the school principal. I know she is not the correct person to deal with this issue, but I also know she will help me if she can. She calls a few minutes later and says she has forwarded my email to the Director of Transportation. She tells me to call her back if by late afternoon I have not heard from anyone. It’s 1:30pm and I haven’t heard from anyone…..I’ll certainly keep you all posted, which is more than I can say for my school district. Ok, it’s later in the evening and I did hear from the transportation office late this afternoon. 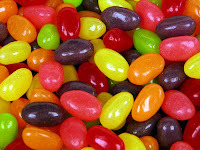 The person on the phone began by apologizing profusely – good start, I'm thinking to myself. She then goes on to tell me that the bus route and driver/aide team are being restored to what they were – another good thing. Finally, the transportation person said she was going to contact the school to get a copy of Ashley’s seizure health plan – even better, but why did I even have to suggest that in my original email? More apologies follow and I am assured that all will be well. I really hope it is. For now, I'm taking off my cranky pants. I so look forward to spending my nights with you, but I hate having to leave each morning. You wrap me in a warm cocoon, and support me in ways you will never know. I want to spend more time with you – lots more time – but can’t because of the demands of my life, especially the need to care for my children. But you always understand that, don’t you? I find myself thinking about you, fantasizing about you, especially in the late afternoon when my work day is drawing to a close but my time of being needed by my children is just beginning. Along about 8pm each night, I start to constantly glance at the clock – mentally calculating the number of hours and minutes until I can be with you again. Those minutes and hours seem to drag by. And on the weekends, I silently pray my children will sleep just a while longer – a few more minutes until I have to leave you again, ending my escape to that utopia to which you take me. I’m very happy that I don’t have to share you with anyone. You’re always there just waiting for me and me alone. 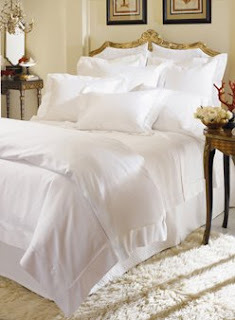 Ahhh yes, my warm, snuggly bed – I will always need you and want you. I hope you know that! I've always been a mother who believes in open adoption. I have always believed that a child can never have enough people who love them. Those beliefs were what drove me to contact my children's birth parents. In Ashley's case, the social worker was a little sloppy with her redacting. I had the birth mother's name, and I knew the area in which she lived. I didn't do anything with that information for many years. But, about five years ago, I felt led to reach out and try to contact Ashley's birth mother. With the help of the Internet, I found an address and a phone number which I thought was correct. I called the phone number, and heard the recording. The voice on the recording said, "Hi,this is Lisa and Lauren. We're not home right now, so please call back." I wasn't sure I had the right number, but when I heard the baby in the background, and figured her name was Lauren, I was pretty sure I had the right number. Why did the baby named Lauren make me think that? I didn't know that Ashley's birth mother had other children. But, I wondered if indeed she had and had named her two girls after characters on the Young and The Restless - Ashley and Lauren. I know it was a leap of faith, but it felt right to me. So, I composed a letter, included a picture, and sent it to the address I had found on the Internet. I heard nothing for two years. But one night I got a call. It was Lisa and she confirmed that she had gotten my letter. Our contact after that was sporadic. Phone calls here and there. An email every once in a while. And then finally, I found her on Facebook. Finally, I had a small window into her life, and I opened wide the window into my life with Ashley. I hoped our relationship could grow, and indeed it seemed to be doing just that. Until last week. Lisa deleted her Facebook account. There is no trace of her other than the comments and messages she has sent me in the past. I keep checking back, but so far she hasn't returned. Full HTML version of the site to make it easier for screen readers to decipher. Facebook Chat accessible by screen readers. Shortcut keys to major areas of the site. This week was the season opening for baseball. My sons have spent most of their Spring Break from school watching game after game on some TV subscription service they saved their money to buy. Yesterday, Mark Wetzel’s story appeared on the Sports Illustrated website. 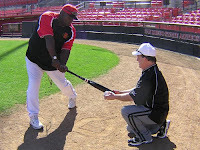 Mark is legally blind and is one of the most successful baseball hitting coaches in the world. After reading the article at Sports Illustrated, check out his personal website, The Blind Guy. Now from the land of ‘what the hell’, check out this story about Eddy Morten. Eddy Morten has Usher’s Syndrome, a condition causes him to be deaf and blind. Air Canada refused to let Mr. Morten travel on their plane alone. Mr. Morten is the father of two and is a Paralympic bronze medalist in Jude, and he can’t fly on a plane alone???? What is up with that? Hope Everyone has a safe and happy Easter, and finds lots of hidden eggs!! Labels: accessiblity, legal matters, making a difference, role models, say what? for a son who likes to cook dinner for me, and who does a great job with it! Loved last night's chimichangas! for the researchers and companies who have developed and continue to develop new seizure medications. Although I don't like that Ashley is on so many of them, I am eternally grateful that they keep her seizures almost under control. for companies and businesses who care enough to make their buildings accessible. for my sign language teacher, Reba. I think I will forever hear in my head, "Not English, Not English!" that Ashley refuses to listen to people who tell her she will never be able to do something she chooses to do. She has proven so many people wrong in the past and continues to do so every day. So there! for my former in-laws and their generous nature when it comes to my son, Chip. Through their generosity, college will be made possible. Thank you! Because Ashley has such a significant vision impairment, she has always enjoyed things that light up. 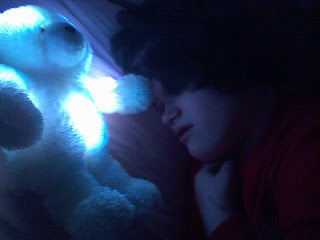 Her friend and aide, Miss Amy, gave her this light up teddy bear, and Ashley loves it. The color changes every few minutes, and Ashley loves nothing more than pulling her covers over her head at night and watching the bear light up! Last February, Amazon unveiled its latest version of Kindle, an e-book reader. The new Kindle boasts some amazing features, even the ability to read the book aloud. Unfortunately, authors of many of the e-books will not allow their books to be read aloud, and today, the Reading Rights Coalition is holding a protest in New York City outside the headquarters of The Authors Guild. The protest will focus on the Guild's forcing of Amazon to place restrictions on the text-to-speech functions of its Kindle 2 device. The group claimed that Amazon's distribution rights did extend to the feature, and the company responded by allowing publishers to disable the text to speech feature on their books. "This is blatant discrimination and we will not tolerate it." said Dr Marc Maurer, president of coalition member The National Organization for the Blind. "Authors and publishers who elect to disable text-to-speech for their e-books on the Kindle 2 prevent people who are blind or have other print disabilities from reading these e-books." Please take a moment to consider signing the petition in support of the protest. 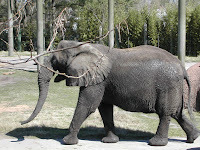 My children and I met our friends Lynnette and Brooke at the Norfolk, Virginia zoo this past Saturday. I have pictures, rescued from my parent's estate, which show my brother and me as 3 year olds feeding the ducks at that zoo. So, I was interested to see how different it would be now so many years later. And not surprisingly, it looked completely different. The remodeling included many accessibility features which pleased me, and anyone in a wheelchair plus one companion could enter at no charge. That's an interesting feature that I have never seen at any other public institution. The walkways were paved for the most part, and the bathrooms had some of the best accessibility features I have ever seen. But, the planners fell short on one very important thing. All the exhibits have fences around them, and the top rail of the fence falls at perfect eye level for someone in a wheelchair. Neither Brooke nor Ashley could see past the fence. I wonder, when facilities are incorporating accommodations for people with disabilities, do they ever ask a disabled person their opinion? 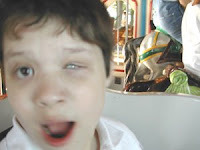 My son, Corey, who has been with our family for only four years, is diagnosed with Asperger's Syndrome. I know what some of the features of that particular diagnosis are, but is an extreme lack of attention to detail one of them? I can't find anything about that specifically, and wondered if other parents had experienced the same thing. Ashley is being evaluated by a group of communication specialists from our local university. The evaluation was initiated about many, many requests to her IEP team. In preparation for the evaluation, I was asked to videotape Ashley communicating in the home and community environments. The school staff would be videotaping at school. Last week I requested copies of the school's videotapes, or at least the opportunity to come to the school to view the tapes. The school's response was "We'll have to discuss that among ourselves and get back to you." Now I know they know I have a right to view those tapes. What is up with their response? Labels: accessiblity, accommodations, assistance needed, say what? I’ve been reading the book, Second Glance by Jodi Picoult. I have always enjoyed Ms. Picoult’s books because they challenge me and make me think 'outside the box'. Second Glance is no exception to that. I’m only about half way through the book, and am still waiting to see how the themes of ghosts and eugenics will be brought together, but I am staying up way too late each night reading. Being a parent of children with intellectual disabilities, hearing the word eugenics is worse than hearing the word f*&k, and anyone who knows me personally will understand the impact of that statement. So, I decided to spend a little time researching eugenics, and in particular, the Vermont Eugenics Project featured in Ms. Picault’s book. In a way, I wish I hadn’t done that. I found an entire website dedicated to documentation about the Vermont Eugenics Project. The website presents its information as an historical perspective to Vermont’s past. There is no position presented (as far as I could tell in my limited research) as to whether the Project was a good thing or a bad thing. Rather, it is just a collection of information. The piece of information that disturbs me the most, however, is a document containing an excerpt of something written by Frederick Osburn titled “Eugenics Policies and Proposals.” It was written in 1968 – yes, 1968 – and that is what I found most disturbing. Did you know that there is still an American Eugenics Society? In 1972 it was renamed “The Society for the Study of Social Biology”, and its current President is S. Jay Olshansky, currently professor of epidemiology at the University of Illinois at Chicago School of Public Health, and a Research Associate at the Center on Aging at the University of Chicago and at the London School of Hygiene and Tropical Medicine. I didn’t spend much time on this research, but intend to spend more. But with just this little bit, I am shocked and very, very worried. that my son will look up recipes on the Internet that he wants me to try. He even makes the shopping list in support of the recipe! that Ashley had several very nice birthday celebrations. And a special thanks to everyone who wished her happy birthday! that my Spring flowers are just starting to show themselves. I love this time of year! for Daylight Savings Time. Now I can get a walk in after dinner and it is still light outside. 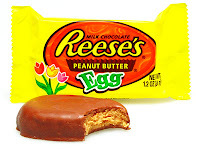 that all the Reese's peanut butter eggs in my house are gone. that the ASL grammar concept that my sign language teacher has tried so hard to drill into me is actually starting to click. that I have no extra things to do tonight. This has been a very busy week - class on Monday night, class on Tuesday night, helping some friends produce a video last night - and tonight, just the usual, kid care - dinner - clean up - two loads of laundry, including folding and putting away - house straightening - ahh, I'm starting to feel lazy already! for the new little video camera that my son bought for me. It's simple, it's digital, and I don't have to keep asking for help to use it! A few weeks ago, I asked my geeky and brilliant son to invent a way for deaf people to play a piano and to ‘hear’ what they were playing. I suggested that he have each of the piano’s 88 keys emit a slightly different vibration which could be felt by the person who was deaf. The piano music would sound like it always does to people who are listening, but to the Deaf person, the music could also be ‘heard’ in the form of the key vibrations. He said he wasn’t an inventor and then asked what was for dinner. This week, however, news stories about two exciting technology advances for people who are deaf and blind appeared via my google alerts, and they both reminded me of the request I made to my son. The first, Picking Up A Good Vibration, tells of researchers from MIT’s Sensory Communication Group who are designing new tactile devices that convert sound waves into vibrations so users can ‘feel’ words. This project was inspired by Tadoma, a method used very infrequently for people who are deafblind, and the subject of my post titled, Can You Feel Me Now?. The second article, titled “Researchers develop braille for vibrating touchscreen devices”, talks about researchers in Finland who are working on a way to have a raised dot in a Braille cell emit a single intense vibration and missing dots to emit a longer, less intense vibration. That Braille cell could then be ‘read’ through touch, a touch screen on a computer for instance. And all this is leading me back to my son tonight for some more talk about that piano! !